Farzana Begum from Hyderabad, B.Sc Graduate. GOOD AT DECISION MA.. GOOD AT TEAM WORK GOOD COMMUNICATION .. GOOD SUBJECT KNOWLED.. GOOD CLASS ROOM MANA.. CARE FOR BELOW AVERA..
are one of expert skill area's of Farzana Begum . 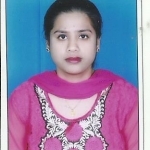 Farzana Begum is working in Teaching/Academic/Education industry.